This fonds consists of diaries; correspondence; manuscripts of articles, books and sermons; published works; research files and class notes; scrapbooks; an assortment of personal materials; and photographs. Fonds comprises family correspondence (including that of his father, Hugh Ross), matriculation records, testimonial letters, personal account books, a diary, school inspectors' reports and other papers and bonds. File contains chemistry lecture notes taken by Alexander Russell during classes with Professor George Lawson. Fonds comprises personal and professional correspondence and papers relating to the schooners Rowena (1903-1907); Lizzie Rich (1905), Stella Maud (1907-1910) and the Carrie C. Ward, including registers, bills, and ship inventories. Item is a handwritten sermon in German dated August 15, 1797 with additional delivery dates of 1800, 1808, and 1811. Item is a signed and sealed bond dated 1760 from the Earl of Halifax (George Montagu-Dunk) to James Wooley for securing an annuity of £100 during the life of the Earl of Halifax. CBC Radio Broadcast Transcript of "Voice of the Pioneer: Norman Archibald MacRae MacKenzie"
Item is a typed transcript of CBC Radio's Voice of the Pioneer featuring Norman Archibald MacRae MacKenzie. MacKenzie, Norman Archibald MacRae, Hon. This fonds consists of correspondence, speeches, lectures, article and book manuscripts, papers and poetry, Greek prose, newspaper clippings, and other miscellaneous records. Item is a certificate by William Wilfred Sullivan, Notary Public, on behalf of George Stewart appointing Reverend John Moffatt as executor of the estate of the Reverend George W. Stewart, Charlottetown, P.E.I. Certificates of discharge (1880-1888) indicate Herbert MacDougall's rise in status from serving as an O.S. (Ordinary Seaman) at age 18, to Mate at age 26. Collection contains photographs of shipbuilding in River John, N.B. Fonds comprises correspondence from William Marshall dated 1896-1898 and 1914-1915. There is also Marshall's illustrated original manuscript of his poem, "Ode to Keats," which he sent to Morse in 1896. 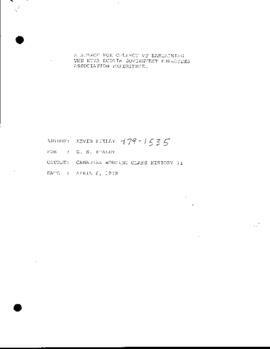 File consists of one bound typescript of "Clearing, the Tale of the First Canadian Casualty Clearing Station, B.E.F., 1914-1919," inscribed by Smith to R. Robart, V.D.